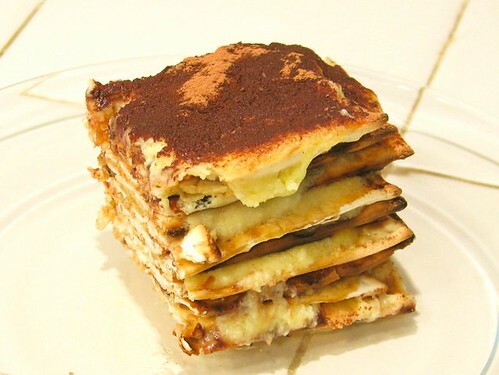 Tiramatzah is a tasty and seasonal variation on a classic dessert: tiramisu made with many layers of matzah bread. Because it’s made with many thin layers of matzah instead of just a couple of layers of ladyfingers, it develops a very interesting flaky and layered texture, much like the alternating custard and pastry layers of a Napoleon. 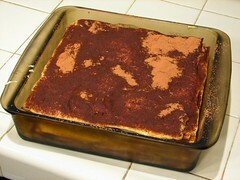 Even so, it retains the distinctive flavor of tiramisu and is a darned sight easier to make than traditional pastries. The first time that I made tiramatzah, it started out as a joke. A friend invited me to a rather informal seder (not something that I normally go to) and like a good guest, I asked what I should bring. They said “Dessert.” I asked “What kind?” They said “Tiramisu.” I should have left it there– as a sign that I apparently make adequate tiramisu, but I was unable to resist the pun and added “Do you mean tiramatzah?” We all laughed, and they were indeed pretty damned surprised when I actually showed up at the seder with a tray full of tiramatzah! None the less, it turned out to be a fortuitous (if silly) thing to make because it was– without doubt– the best tiramisu that I had ever made. So now, we just keep doing it. 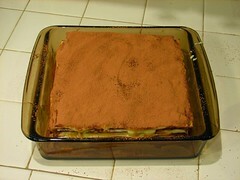 The starting point for tiramatzah is a standard recipe for tiramisu. Most tiramisu recipes are fairly similar and you can start with whichever you happen to like. We happen to use a modified version of that in the cookbook Beppe Cooks!, and we have three other cookbooks that have recipes with only minor differences. Cooking for Engineers has step-by-step instructions on how to make two variations, a simplified modern version as well as a more traditional version. The first step is to make the zabaglione, or interstitial custard, according to your recipe. 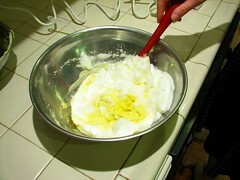 Generally speaking, this involves whipping egg whites, and folding them into a mixture of sugar, mascarpone cheese, and egg yolks. 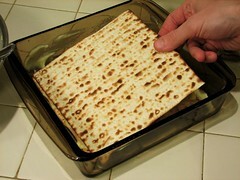 We used a 9″ square baking dish because the matzah pieces fit almost exactly into it. 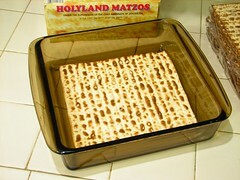 The matzah on its own, much like the traditional savoiardi, is a hard, dry, and fairly unintersting biscuit. 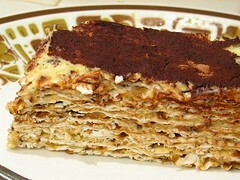 In tiramisu, that is fixed by soaking it in a traditional mixture of espresso and marsala wine. The two basic methods of wetting the biscuits are to dip them in the mixture or to paint the mixture on with a pastry brush. 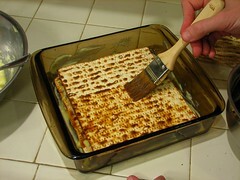 Dipping tends to get excellent uniform coverage, but you will a need second large and flat baking dish in order to dip a whole piece of matzah. The other thing to worry about is that it can be hard to handle either matzah or savoiardi when they become soaked through. For this particular batch we used the pastry brush method– mostly because it photographs more easily. 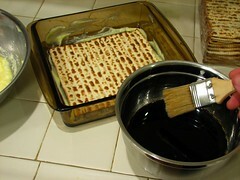 To do this, just paint a generous layer of the mixture over the entire visible surface of each layer of matzah that you use. Whichever method you choose, be aware that different types of matzah can soak up different amounts of liquid, and you may need to readjust your method accordingly if you switch between different types. 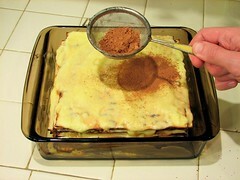 Unfortunately, this is the single most difficult step in the recipe, because the final character of the tiramisu (or tiramatzah) is largely determined by the amount of the mixture that is soaked into the biscuits– use too little or too much and the final product will be dry and papery or wet and slimy. You may need to try a couple of times to get it just so, but don’t worry– you can always find people to help you dispose of slightly imperfect desserts. 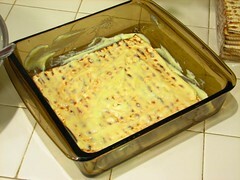 After each layer is soaked with the coffee mixture, add a layer of custard and spread it evenly. 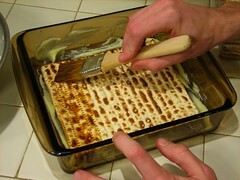 Then, add another piece of matzah on top and soak it with the coffee mixture as well. 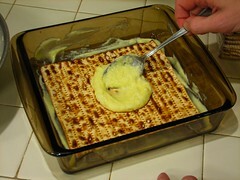 Repeat until you run out of ingredients (matzah, custard, or coffee mixture) or the until stack gets too tall. 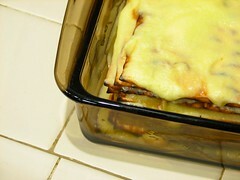 The last layer is finished here, near the top of the baking dish. It looks pretty sinful at this stage. Of course, that’s because it is. It’s amazing how much saturated fat and cholesterol you can get in just a few eggs and a few ounces of mascarpone! 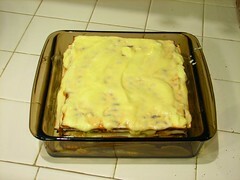 Sprinkle an even layer of cocoa over the top layer of custard. At this stage the tiramatzah needs some time in the fridge for the flavors to come together, and for the matzah to soften. At least three hours, preferably overnight. The only visible difference, as you see above, is that some of the cocoa should become wetted by the custard. Now eat it, silly, or feed it to your guests. You don’t even have to tell anyone that there’s matzah in it. This entry was posted in Play with your food and tagged diy, food. Bookmark the Permalink. just to let you know there is justice in the world – found you because you were linked to on Pim’s site in reference to the evil wanker thief and was sooo excited to hear of something called Tiramatzah! You can bet your sweet bippie that this will be on my passover table next year!